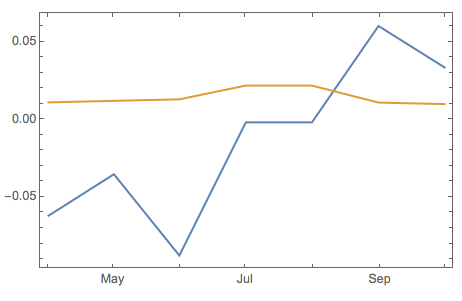 I have a set of sample time-series data below of monthly prices for two companies. Q1. I want to calculate monthly and quarterly log returns.what is the most expedient way to do this? TimeSeriesAggregate only has the standard Mean, etc. Q2. With the returns from Q1, what is the most expedient method to calculate the correlation of the monthly returns between the two companies? Q3. How would it be possible to calculate six-monthly log returns and then create a series of overlapping $6m \log$ returns so I can derive $7\times 6M$ outcomes from the limited dataset below; i.e. [1m-6m, 2m-7m, 3m-8m, ...] (and then calculate a correlation between these)? The code below was written with the assumption that you want to keep your data within TimeSeries objects. (Since you mention "time-series data" and TimeSeriesAggregate.) That is not necessary with the regular grid of dates in the data you provided; you could use simple lists of numbers instead. You can redefine LogReturn accordingly. Q1. TimeSeriesAggregate works with any function, it maps over non-overlaping windows. Q3. Use MovingMap to map over overlapping windows. Not the answer you're looking for? Browse other questions tagged time-series or ask your own question. 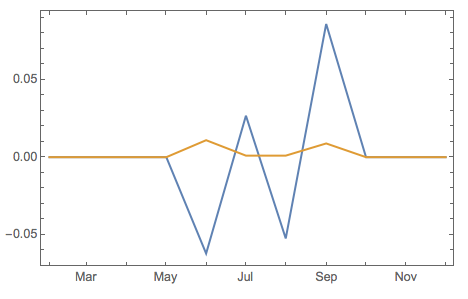 How to slice TimeSeries data? How to prevent TimeSeries adding TimeObject parameter and TimeZone option to DateObjects? Inconsistent arithmetic of TimeSeries with non-equally spaced data?